One of my favourite desserts is the classic Italian panna cotta. 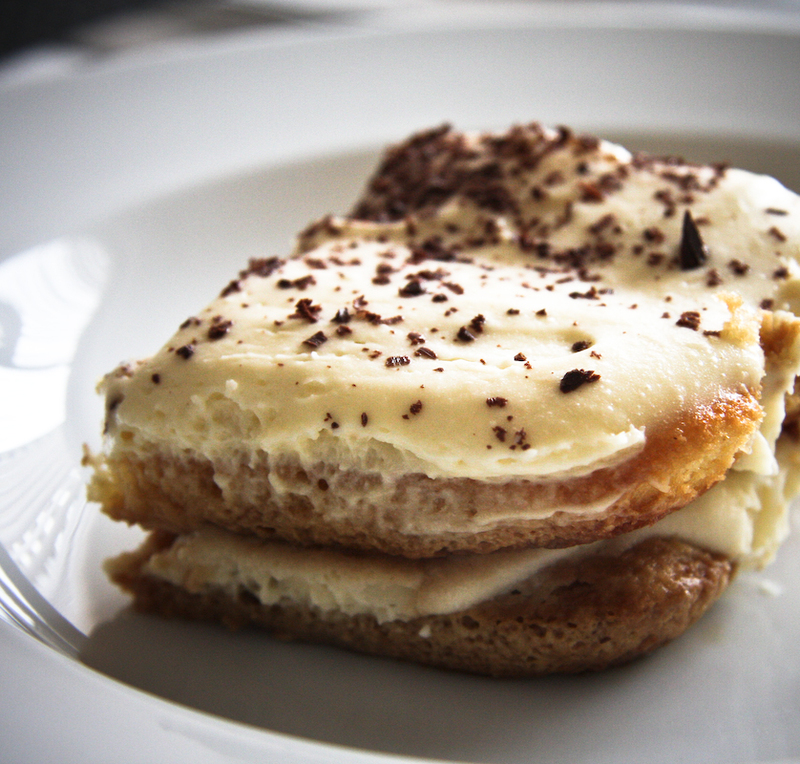 It’s a great dessert that’s light in texture and rich in flavour. I never feel heavy after eating it, making it my kind of dessert. The best part, it’s very easy to make and the prep time is fast. That said, it does require a longer time in the fridge for the gelatin to set, so if you’re making it to serve for dinner – it’s best to make it either the day before or early enough in the day for the dessert to set. Heat up water and sugar in a saucepan until the sugar is dissolved. Add peach halves (or other fruit) and simmer on medium-low heat until the fruit is soft. Remove the peaches (or other fruit), remove the skins (keep the fruit water). Take 1/4 of the peach water and add the tablespoon of gelatin in gradually while stirring to avoid clumps. Set the gelatin mixture aside for about 5 minutes – it will thicken. Pour the gelatin mixture into the rest of the fruit water on low heat and mix until it’s dissolved. Grease a baking pan and place your peach halves or slices (or other fruit) into the bottom of the pan. I like using a silicone loaf pan. The silicone is flexible, making it incredibly easy to pop the panna cotta out of the pan once it’s set. If you’re using peaches, plums, or pears, place them cut side facing up (uncut side down on the pan) – it makes for a better looking panna cotta when you’re done. Pour the fruit water over it. Place the pan into the fridge for it to start setting. Stir in the 2 tablespoons of gelatin powder into the 1/3 cup of water gradually (so it also doesn’t clump) and set it aside for around 5 minutes to set. Heat up the cream and sugar on medium-low heat and bring it to a simmer. Add the vanilla extract and stir to mix it in. Add the gelatin-water mixture and stir until it’s all dissolved. Cool the mixture in the fridge for around 15-20 minutes or until it’s cooled to about room temperature. Check to make sure the first layer has set. 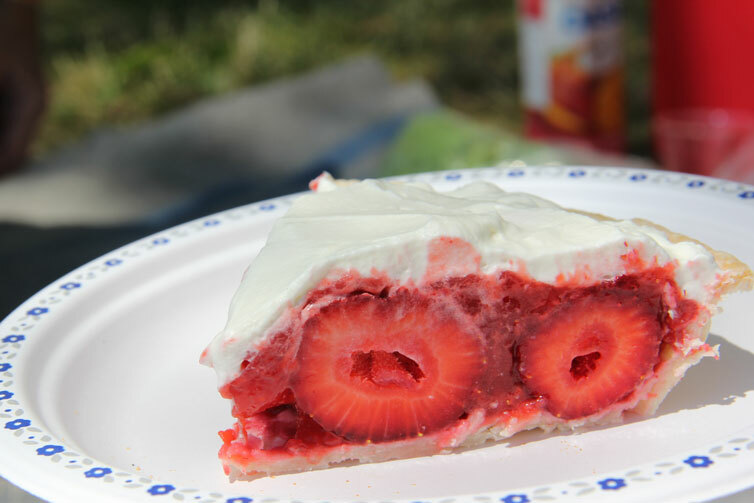 When it has, pour the panna cotta mixture into your baking pan over the fruity layer. Put the pan back in the fridge to set. It will take around 6 hours to set fully. Once the panna cotta has set, it’s ready to serve. Tip your baking pan upside down on a serving dish. It should pop out fairly easily. Note, if you prefer to use canned fruit instead of fresh fruit, use the syrupy water from the can and add water to it until it reaches 1 cup. No need for the 1/2 cup of sugar at the start of the recipe. Just set the fruit aside and pour the syrup-water mixture into a saucepan and let it simmer for 1 minute. Follow the rest of the recipe from step 4. Recipe adapted from Donna Hay. My girlfriend and I recently stopped by the Golden Regency Restaurant at Pacific Mall for dim sum. The restaurant was bustling with people when we and our growling bellies arrived – which is always a good sign. 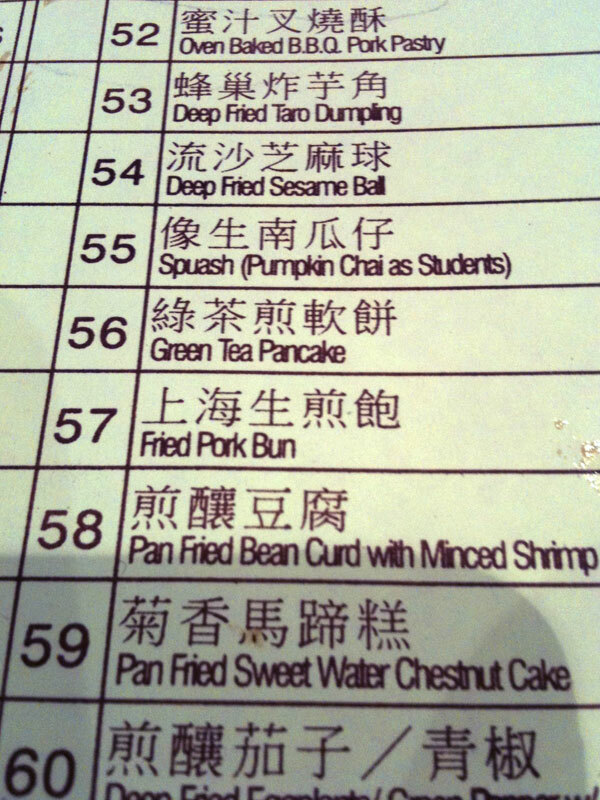 We were immediately seated, and quickly got our order in of many of our favorite dim sum dishes. Before long, the dishes started to arrive and soon our small two-person table was overflowing with food: pan-fried turnip cakes, steamed beef balls, an assortment of dumplings, steamed sticky rice wrapped in lotus leaves, Chinese donuts wrapped in rice noodles, egg tarts, and mango pudding. Everything was fantastic. Then came another dim sum cart. The kindly lady offered us a selection of other delicious looking desserts. Despite our full bellies and the food laden table, we agreed to try a new dish we’d never heard of before: a green tea pancake. This pancake is the reason I decided to write this post. It is one of the best things I’ve ever eaten – and almost rivals the incredible cat fish that once took my breath away in Reykjavik, Iceland. At first, the flavour is moderately sweet, with a subtle hint of green tea in a bean filling. 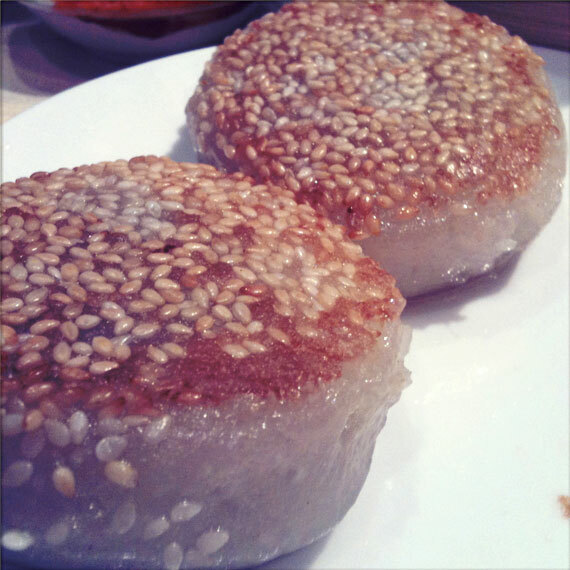 All of this encased in a sesame-covered, pan-fried glutinous rice cake. However, a few moments after your first bite, the fuller aroma hits you. A beautiful, floral flavouring that lingers in your mouth. Delicate, aromatic, and delicious. If you have the chance to visit The Golden Regency Restaurant, I highly recommend you try this dessert. It’s like nothing else I’ve ever eaten. Before trying my hand at this dessert, I always had it in my mind that it was a daunting task that came with a disclaimer. Everyone had a different version: only egg whites, no eggs, heavy cream… and the list goes on. Where to start?